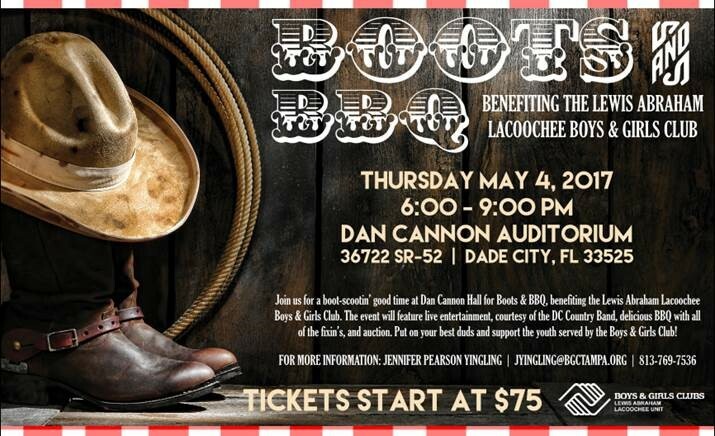 Johnson & Cassidy Sponsors “Boots & BBQ 2017” Supporting Lacoochee Boys & Girls Club – Johnson & Cassidy, P.A. Lacoochee, Florida is an old mill town in Pasco County, Florida. A little more than an hour drive from Tampa, in many respects it is a world away. When the mill shut down decades ago, nothing replaced it. Families live in poverty, unfamiliar with simple things that we take for granted, such as how to place an order in a McDonald’s restaurant – or any restaurant for that matter. Technology simply is not an option; keeping the lights on is a struggle. The children of Lacoochee often find their only meals at school, where they qualify for free breakfast and lunch. With the support of many members of the Pasco County community, the Boys and Girls Club in Lacoochee has made a tremendous difference in children’s lives. At the Club, the children have a safe environment to learn not just technical skills, such as how to use a computer, but life skills, such as what a living room and a dining room look like in a home. The Club provides after school nutrition during the school weeks and food backpacks for the weekend that ensure the children will have food for days they are not in school. Johnson & Cassidy was thankful to be able to be a sponsor at the 2017 Boots and BBQ fundraiser for the Lacoochee Boys and Girls Club. We were greeted as we walked into the event by energetic, smiling young men and women who have opportunities that come from the care and leadership they receive at the Club. We shared an evening of delicious food and community, enjoyed bidding on live and silent auction items, and visiting with friends who are passionate about the welfare and success of these children. At the end of the evening, we left knowing that we are fortunate to support an organization that changes lives, providing a bright light in a part of the Tampa Bay community that might otherwise be a very dark place. Team Johnson & Cassidy Wins Fourth Consecutive Gasparilla Race Challenge!